The DJI Mavic Pro Platinum once again sets the bar for portable drones. Being able to fly for 30 minutes, with even quieter props means that your flight will be even more enjoyable. With a 60% reduction in noise, take off and landings have never been quieter. The 8331 propellers give a solid boost to noise control, as well as stability. With 24 computing cores to help operation, this drone packs more technology and sophistication than any of it’s predecessors in it’s class. Four vision sensors propel flight autonomy to new heights. The three axis gimbal ensure that your 4K camera will be positioned to capture steady, clear images of the world around you. Controls have never been sleeker or more intuitive, and commanding your Mavic Platinum with a tap of your finger keeps your flight path clear with ease. Many frustrations in flight are due to an issue with one of the on-board sensors. With the new Mavic Platinum, having 2 of each key sensor means that the chances of that happening are greatly reduced. Using the DJI GO Editor and Go app, you can not only see everything your drone sees in real time, but you can monitor your drone’s vital such as remaining battery life, flight time, drone location and flight path. Easily share your new images with the world using the DJI Go Editor using just a few taps. DJI Goggles offer a completely immersive flight experience and an incredible and unique first person view of the world around, as can only be seen by a drone in flight. 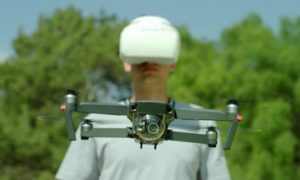 DJI Goggles for sale on the VeryDrone website will help you take control of on your aircraft in amazing ways, including control of photo and video captures. Combined with intelligent flight modes like Tripod mode, cinematic mode, terrain follow, TapFly and ActiveTrack, the DJI Goggles really allow you to make the sky your canvas. The DJI Mavic Pro Platinum is equipped to fly in conditions others can not. Flight Autonomy and an increased number of redundant sensors allows the aircraft to to detect obstacles almost 50 feet away, even when it’s flying at 22 miles per hour! Increased maneuverability make the Mavic Platinum the perfect choice for professionals who depend on rock steady award winning shots, and drone enthusiasts who can only get out and fly on the weekend. Being able to maximize flight time is critical and this drone definitely has that covered. DJI Mavic Pro Platinum with Free Shipping! Contact VeryDrone today if you have any questions, at 954-580-9551 Our experts can help make sure you get your questions answered, and pick up the drone that’s best for you.